If on a cold winter morning you find yourself driving down Interstate 5 into southwest Oregon, you could be forgiven for thinking you’ve taken a turn into the Netherworld. A gauze-like fog swallows semis perilously close to runaway truck ramps. The visible road narrows, bracketed by dark walls of spiky pine trees. The land sprouts signs warning drivers to use chains, ominous entreaties not to stop by the side of the road. It is only fitting, then, to be out looking for wolves, creatures whose moon-yellow eyes seem to belong in this preternatural landscape. No less politically charged is “the wolf question,” as Oregonians refer to it. Ranchers and farmers, themselves just scraping by, assemble at backyard meetings or in chatrooms, railing against the provisions of the Endangered Species Act. 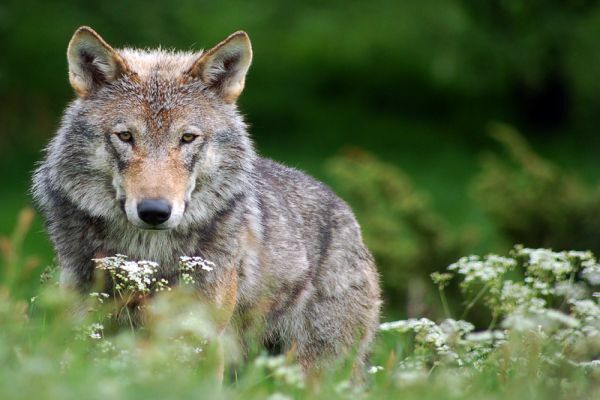 Conversely, others support their state’s wolf sanctuaries by donating deer and elk kills. They all have opinions. All have stories. Started as a hobby in 1991 by Charlie and Sherrie LeBat, Howling Acres was licensed by the USDA in 1999. The sanctuary, which functions as a retirement home for gray and red wolves, and wolf/dog hybrids, currently houses 15 animals. The LeBats aren’t biologists; they’re wolf lovers, plain and simple. Their story began with a single wolf pup, surrendered by an Alaskan photographer. From there, it was a matter of research and grunt work, with Charlie, a former bodyguard for Willie Nelson, and his wife Sherrie learning everything they could about wolves, hybrids, and, perhaps most importantly, about people, about the public’s fear of and admiration for the North American wolf. At its height, Howling Acres (or HAWS) performed weddings with wolves as witnesses, hosted concerts and large-scale educational tours, allowed on-site camping, and welcomed volunteers from around the world, including one of Queen Elizabeth’s nephews, all eager to get close to wolves. Several of the wolves, deemed “ambassadors,” participated in hands-on demonstrations with the public. Now, however, due to tighter governmental restrictions, the ambassador program has been disbanded. In fact, many of the sanctuary’s unique opportunities have been scaled back. HAWS is at a crossroads. Currently, only a handful of volunteers run the sanctuary. In frail health, Charlie and Sherrie are unable to be as involved as they once were. We were led on a tour of the sanctuary’s 13 acres by Brandynn Boyles. Like the LeBats, Brandynn is a self-made wolf expert, obsessed with wolves from an early age. He discovered the sanctuary by accident, began volunteering, and within days could identify each wolf by sight and sound. With his back to the compound, he tells us that it’s Apache, a large male wolf, who is almost imperceptibly whining for him; when we turn around to look, he’s right. The wolf stories at HAWS are overwhelming, from the tragedy of Beasley, whose eyes were gouged out, and Tango, who escaped a Montana fur farm, to the comedy of Wewonka, who barks in her bath tub, and Annie, a red wolf who makes neat piles of her meat. The wolves and hybrids, each with unique personalities, are also markedly different from zoo wolves. With one exception, they don’t pace neurotically in their enclosures or exhibit what biologists call “hyper-vigilant” behavior, akin to post-traumatic stress disorder. When four juveniles happily scampered up to us like noisy frat boys, you’d hardly know their future at the sanctuary was imperiled. Though HAWS maintains support in the community, it also has its enemies. Rumors abound, from media reports that the sanctuary is defunct to false claims that the wolves have escaped and bitten children. The campaign against HAWS has been ugly and violent, with one pro-sanctuary documentarian becoming the victim of arson. Eco-terrorists have set fires and continue to make threats. Most tragically, during a tour years ago, a man threw meat soaked in radiator fluid into one of the compounds, fatally poisoning one of the wolves. The wolf, Lady, was cremated, ashes blessed by a medicine man, and buried in the wolf cemetery near Sherrie’s own grandmother. Despite the antagonism, when I asked Brandynn if believes he’s ever changed someone’s mind about wolves, he responded “For sure.” He believes in the future of Howling Acres, especially if new owners can be found, if individuals continue to visit and donate their time and resources. As an example of his faith in the sanctuary, he mentions a neighbor who bought the LeBat’s house back for them after they went into debt buying meat for the wolves. He enumerates donations of dog food, buffalo, elk, and deer. HAWS may be at a crossroads, but its spirit, like its wolves, remains vibrant. Further north along the Alsea River, deep into the Siuslaw forest, is White Wolf Sanctuary, a non-profit founded by Lois Tulleners. White Wolf Sanctuary houses 10 Arctic wolves on60 acres of land, bisected by a sophisticated fencing system designed by Tulleners to allow maximum space for the wolves while also separating individual packs when needed. Among Tulleners’ goals are: “to provide and improve conditions for rescued wolves, protect and preserve habitats in the wild, elect public officials who protect wildlife, and work toward long-term recovery in the wild.” Like HAWS, WWS is not a breeding facility; it does not contribute to a cycle of captivity, nor does it release its wolves into the wild. Unlike HAWS, the wolves here are pure, neither wolf mixes nor dog hybrids, something that Tulleners points out with pride. Another difference between the two sanctuaries is location. HAWS is off the beaten trail but well marked, while WWS does not give out its address. When we made an appointment to visit, something both places require in order to keep stress low for the wolves, we were told to meet at an abandoned gas station near the sanctuary. There we were met by Cindy, a volunteer who allowed us to follow her vehicle up a windy, unmarked, two mile road, thick with moss-heavy trees, to the sanctuary itself. From all appearances, WWS is thriving, as are its wolves. Each day, however, is a struggle, from battling thousands of ravens, which seize up to half of the wolves’ $300/day food, to handling stubborn wolves and staying afloat financially. Tulleners explains that, as a non-profit, they survive on donations and their gift shop, bookstore, and adopt-a-wolf program. Sometimes, in order to economize, medical procedures have been performed in the gift shop with a makeshift lamp and table. WWS doesn’t receive grants, and, like HAWS, Tulleners and her staff are grateful for visitors, volunteers, and donations of food. Tulleners holds a roadkill permit that allows her to supplement the wolves’ diet of store bought meat. By dietary standards, her wolves are likely healthier than those at HAWS, who get meat only once a week and subsist mostly on dog food. Tulleners also has had fewer deaths, fewer cases of cancer. Tulleners attributes her success at WWS to careful, ongoing planning. In the beginning, she bought 60 acres, surrounded by national forest land. 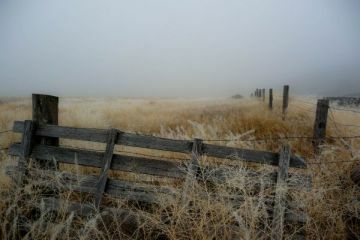 Her 10 foot high, three feet deep fence offers tangible proof that her wolves are not likely to escape. She has a will in place to care for them, and a creative wildfire rescue plan that entails loading them on an abandoned school bus. When asked why she thinks HAWS has suffered so much trouble, she notes, “What shuts a place down like HAWS is being in an area with neighbors. Neighbors are your biggest enemy, and then howling, overcrowding, and fear.” Tulleners maintains that the only opposition she has experienced has come from the occasional person on a tour. However, her unmarked road and double locked gate would suggest otherwise. In person, Lois Tulleners comes off as the Annie Oakley of western Oregon. She’s quick-witted and sharp-tongued. Asked if she has trouble with hunters encroaching on her property, she chuckles, “People don’t fire around here because they know I’ll fire back.” A former counselor, karate teacher, and singer, Tulleners became involved with wolves when her boyfriend brought home two wolf-dog hybrids. The boyfriend didn’t last, but the wolves did. 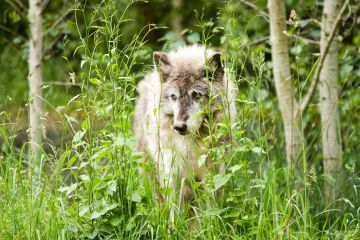 While volunteering at zoos, sanctuaries, and contributing to Yellowstone’s wolf recovery program, she began planning her own habitat for Arctic wolves. In time, Tulleners sold a cozy Seal Rock beach house in order to buy land, fencing, and a tiny cabin with no water or heat. She’s suffered her share of tremendous setbacks, enduring third degree burns to her arms and face from a fire that claimed her makeshift cabin, yet 25 years later, she’s still there for her wolves. It seems there could be no fiercer wildlife advocate than this woman, who, like the LeBats, turned her love of wolves into her life’s purpose. “We can co-exist with wolves,” Tulleners says. “Everybody has a right to make a living, but the point is we need to compromise. So far, only our wildlife has had to compromise.” At WWS it’s easy to see the results of that compromise, to hear the wolves’ affecting stories, like the siblings rescued from a Minnesota fur farm, their legs atrophied from being trapped in small cages. Those same wolves have now been successfully rehabbed, nursed back to life on a doe’s milk sac by Tulleners herself. Ultimately, a trip to WWS grants visitors an opportunity few can ever experience: the chance to get up close and personal with wolves. To pet them, have them lick your face, and to hear their eerie, transcendent howl ricochet off the peaks back to your core. For more animal sanctuary perspectives read Marieke van der Velden’s transition from elephant tourism to elephant voluntourism and Stephanie Downs’s experience volunteering for animal rights in Greece.